After my last rant on how women’s cycling works, I’d like to help you out. 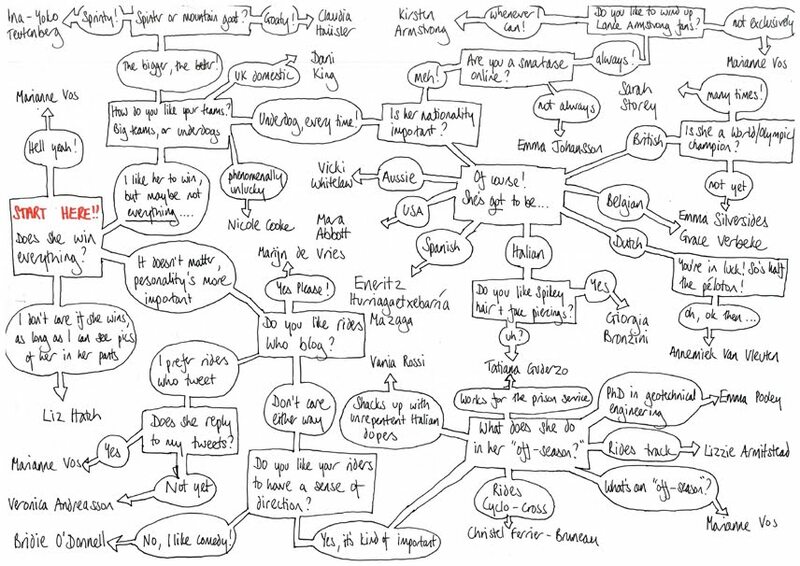 OK, OK, I’ve missed off a whole load – but I didn’t have a piece of paper big enough to include the entire péloton! For example – Kirsten Wild is the uber-sprinter who’s currently tearing up the Dutch road (and is a good choice for the World Championships) – and Sharon Laws may be my joint favourite rider, with one of the best stories around – but Cervélo have too many riders on there as it is! 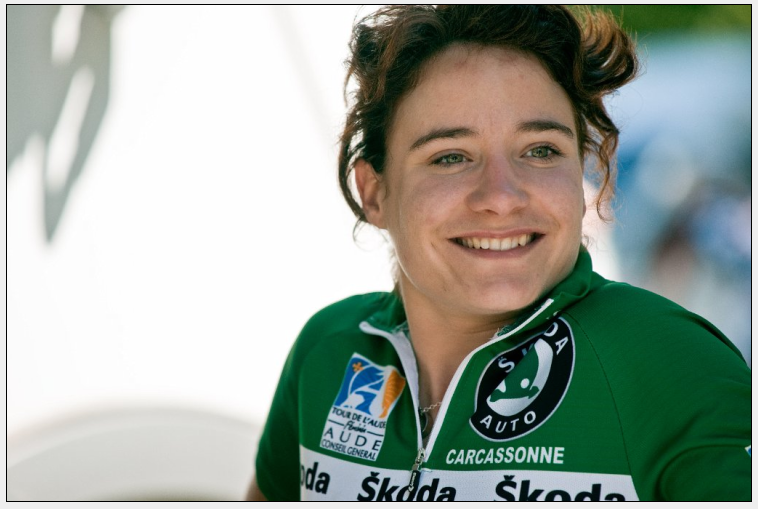 “But Pigeons”, you may be asking “who is this Marianne Vos?”. And I’ll forgive you, if you’re asking that, as long as you promise to like her as much as I do. Well, Marianne is a 23-year old Dutch woman who rides for Nederland Bloeit and who has already won the World Championships on the road, on the track and 3 times at cyclo-cross, and the Olympic gold in the Points race. She’s pretty bloody impressive by anyone’s standards, but she also seems like a really nice person as well. She describes herself as a “full-time-hobby-cyclist”, and whenever I’ve seen her interviewed, she comes across as having this genuine love of riding, who feels lucky to be able to do something she loves for a living. I am a bit of a rabid fangirl (you might not have noticed this), and one of the things that’s lovely about the women’s race is the way riders will take the time to reply to fans on twitter and the like – and having someone like Marianne, who’s won *everything* reply to my tweets, seems so unlikely, but is great. Anyway, Marianne rides year-round, and I’ve read rumours her next goal is the omnium at 2012 – so hopefully she’ll be returning to the track – and doubly hopefully will be riding at the Manchester round of the Track World Cup in February…. If that happens, and you hear of someone cheering so hard their head explodes, that’s likely to be me, going crazy at a race with Giorgia Bronzini, Tara Whitten, Lizzie Armitstead, Yumari Gonzalez AND Marianne Vos in it! This week/end is amazing for cycling. If you like sprinting, your race is the RaboSter Zeeuwsche Eilanden, a 3-day stage race in the Netherlands. It’s flat, but with a ridiculous amount of wind, and to say Cervélo is dominating it is a little bit of an understatement. Remember how women’s teams only have 6 riders? Well in the first stage, the Time Trial, ended with an all-Dutch, all-Cervélo podium of Kirsten Wild, Regina Bruins and Iris Slappendal, 5 riders in the top 6, and their 6th rider, Sarah Duester finishing 11th. That’s just crazy-strong! I’ll blog at a later date about how I’m conflicted about Cervélo, but they are seriously good. Yesterday’s stage was also a Cervélo-fest, with Kirsten winning again and Charlotte Becker 2nd – but this time at least, another team got third, in the shape of Martine Bras – today they only managed 1 on the podium, as Janneke Kanis won the stage for Nederland Bloeit, with Iris Slappendal 2nd and Annemiek Van Vleuten (who’s been one of my stand-out riders so far this year) in 3rd, also for Nederland Bloeit. Surprise, surprise, Wild won the overall race, with Slappendal 2nd in GC and Van Vleuten 3rd. You can read how the race unfolded on the site’s fabulous ticker – we don’t often get this much news about women’s races, so make the most of this! There were are also a lot of British women riding – including Lizzie Armitstead for Cervélo, and Kate Cullen for MovingLadies, who’s in great form after wining a load of races on the Dutch domestic circuit. It’s a continual issue that the only way to make a living as a British female cyclist – or even race regularly – is to base yourself in the Netherlands or Belgium – but it’s great to see that so many are managing. Cervélo also had an amazing day at the climbing race of the week – the Giro del Trentino in Italy. This is definitely one for the mountain goats – yesterday’s stage started at the bottom of an Alp, and continued for 43 solid uphill kilometres to the top, before a descent all the way down. I love this race – and this year it’s back to three days, after shrinking last year, which is great news. Emma Pooley completely owned the stage yesterday, solo-ing to a win nearly 3 minutes up on Top Girls Alessandra d’Ettorre and Safi-Pasta Zara’s Rasa Leleivyte. Two more stages to go – I recommend Podium Café’s preview for telling you more…. but Cervélo are super-strong here, with 4 riders in the top 20…. Oh, breaking news – Ina-Yoko Teutenberg won stage 2 of the race. I’m surprised by that, as she’s a super-sprinter, and the stage was very lumpy – but HTC-Columbia are very strong (although 2010 hasn’t been as good for them as I was expecting). Mind you, I was also surprised she was riding here in the first place, as RaboSter is much more suited to the sprinters, so what do I know?! Chapeau to Ina! Emma Pooley still in the overall lead – and by the time you read this, I’m sure all the results will be in. So you might be thinking Cervélo are the best team out there, but there’s one better this week! Thursday saw the first ever women’s race as part of the Tour Series of city-centre crits – the Horizon Fitness GP. I’ll fangirl on about the Horizon Team and how much I love them another time, but one of the things I like best about them is their ambition of increasing interest and participation in women’s cycling in the UK in more ways than just having a team. I don’t know how Stef Wyman does it, but he persuaded Horizon to sponsor, and the Tour Series to support this race, as hopefully just the beginning. Oh Horizon, how I love you! And not only did Horizon’s Dani King win the race, with ‘Cross star Helen Wyman in 3rd, but all 6 of their riders came in the top 10. That’s better than Cervélo! Motorpoint’s Hannah Barnes came 2nd – she’s definitely a young talent to look out for in the future, so remember her name. You can read a race report here – and I can’t recommend the Horizon website enough – they have regular blogs from riders, and it gives a real insight into what it’s like for young riders trying to make cycling their career. “The Heat is On” from Jim Fryer/BrakeThrough Media on Vimeo. Mirjam Melchers and Cervélo DS Jean-Paul Van Poppel are expecting a baby! Mirjam is taking maternity leave – and isn’t it fun to imagine the future cycling career of that baby! Next weekend is a whole swathe of National Championships – and we’re getting closer and closer to the biggest and best stage race of the year, the Giro Donne…..